The Wild Storm is a conspiracy science fiction thriller comic written by Warren Ellis and illustrated by Jon Davis-Hunt. It also happens to be a continuity reboot of the old WildStorm universe that ended in 2010 and was incorporated into the DC universe with the New 52. 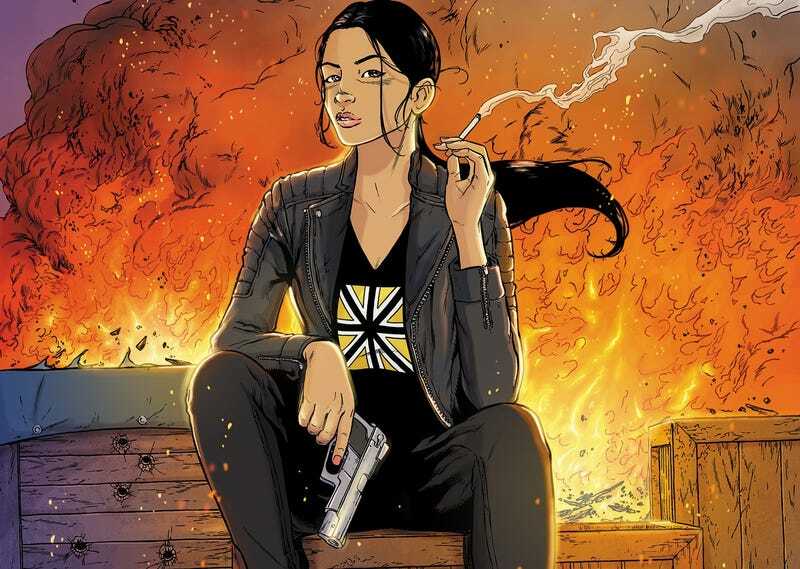 So far, The Wild Storm has been building up its plot slowly, introducing us to characters like Angela Spica (the Engineer from The Authority), Michael Cray (Deathblow from Team 7), and a wild Covert Action Team (yes, that is what WildC.A.T.s stood for back in the old WildStorm days). It has been a fascinating look at re-imagined and updated versions of old characters inserted into a world filled with wild conspiracies and secret spy organizations. When I first read this, I thought immediately that this was a re-imagined Jenny Sparks, but then I realized that it couldn’t be her. Jenny Sparks, for those who haven’t read Warren Ellis’s Stormwatch or The Authority, was the Spirit of the 20th Century — and she was called “Jenny Sparks” because she could manipulate electricity, which was the innovation that drove the 20th century, from radio to television to computers. Being the Spirit of the 20th Century, however, when it became the 21st century, Jenny died and a new Spirit was born. And since The Wild Storm obviously takes place in the 21st century, this, then, couldn’t be Jenny Sparks. So then I thought that this character had to be Jenny Quantum, Jenny Spark’s successor and the Spirit of the 21st Century. Except that Jenny Quantum never wore the Union Jack shirt — that was Jenny Sparks’ thing — and her powers were a lot more, well, nebulous. (It wasn’t until much later that I even realized this new Jenny wasn’t even wearing the Union Jack, but something else entirely.) When Jenny Quantum was introduced, it was the year 2000 — and nobody quite knew what the innovation that would drive the 21st century would be, so Ellis (or Mark Millar, the writer who succeeded him in writing The Authority) just chose “Quantum” as the new Spirit’s name (even though, unlike “sparks,” “quantum” doesn’t really mean anything — in physics, it refers to the smallest possible unit, therefore “quantum physics” is about physics at the smallest possible level). So while this could be Jenny Quantum, it didn’t seem like it. She seemed to be a mixture of Jenny Sparks (outfit and demeanor) and Jenny Quantum (ethnicity), but with a new set of powers. Jenny Sparks was shown to travel through electricity, but never appear within phones and television screens. This Jenny not only travels through TVs and phones, she is building up an interconnected network of information. The innovation that is driving the 21st century isn’t quantum physics or mechanics or whatever. It’s the internet. It’s Twitter and Facebook and social media and the ability to get the news on your phone wherever you are no matter what and the ability of anyone — even the President of the United States — to shout their thoughts at 3AM to the entire world and have the entire world listen. It’s the internet of things and everything that entails. This isn’t Jenny Sparks or Jenny Quantum.